We offer a wide range of industry expertise, working with growth-oriented companies in the public and private sectors in telecommunications, media, technology, consumer services, financial services, manufacturing, and consumer products. To date, we have completed more than 2,500 executive searches at the VP-level and above and for boards directors of public and private companies. We serve companies across numerous functional areas, including: finance, human resources, sales, marketing, engineering, and information technology. Amount of Repeat Business over a 35 year period. Amount of Diverse Executives Placements. Years HFA has been within the Top 35 Executive Search Firms in the U.S., out of approximately 1,600 search firms nationwide. The number of Executive and Board Level Searches that HFA has completed. Audit Process that helps predict culture fit, success and executive career development. The targeted number of Searches per Consultant at a time. 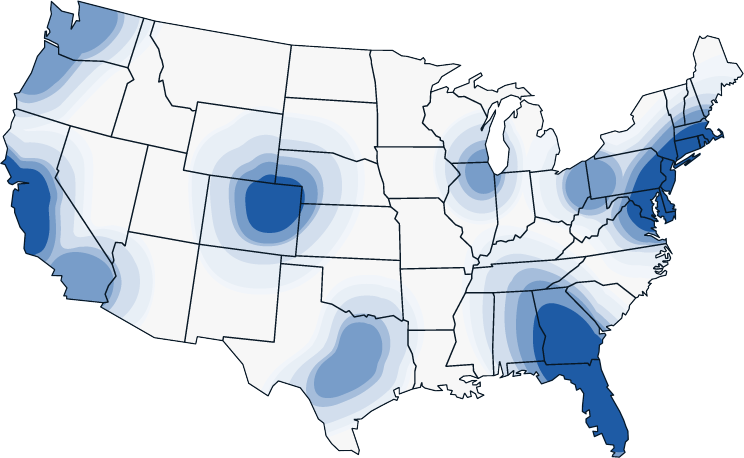 This map represents the concentration of searches HFA has done across the US.